Earlier this week, we found new Beach Bungalows available for guests to rent at Royal Caribbean's private destination of CocoCay, and stumbled upon another way to relax: beach beds. Full-day beach bed rentals are now available on CocoCay, which allow you and those in your group to enjoy your own beach bed, nestled among the palm trees of South Beach. They provide a relaxing view of the ocean, while allowing for privacy with adjustable curtain walls. 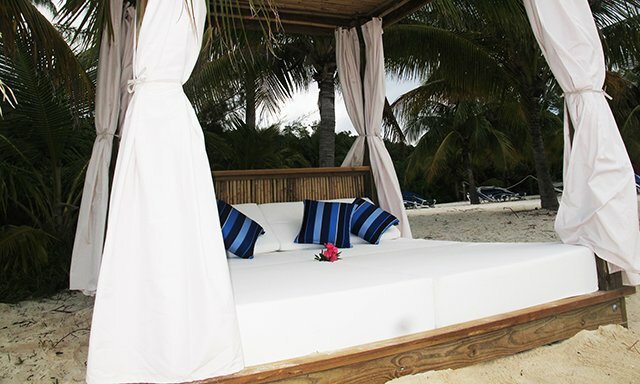 Each beach bed includes two floating beach mats, a cooler stocked with four bottles of water and beach towels. Transportation to and from Beach Beds is via private Cocolimo. The cost for each beach bed rental is $150 and has a maximum of six people per beach bed. Thanks to Kayla for alerting us to this addition.